For many years, Dubrovnik budget travel tips would have fallen on deaf ears. The city was located behind the iron curtain for half a century, and then it was within the crossfire of the Croatian War for Independence from 1991-95. None of that was particularly appealing to visitors. But this is one of Europe's most beautiful cities. It has been rediscovered in the past two decades. Cruise ships bring huge crowds. The city has widespread appeal, attracting both upscale travelers, backpackers, and most everyone else. Dubrovnik is, by far, Croatia's most visited city. Budget travelers who count on eastern European affordability might leave partially disappointed. Prices have risen dramatically in recent years for restaurant meals, accommodations, and tours. Don't bypass this place! Consider a few ways to visit this beautiful city on a budget. Dubrovnik is located on the Adriatic Sea, in southern Croatia, not far from the borders with Bosnia-Herzegovina, and Montenegro. It is about a day's cruise ship sailing from Venice, its traditional city-state rival in ancient times. Dubrovnik Airport is about nine miles south of the city Buses, and taxis connect with the town center for about USD 6 each way. During the winter months, there are relatively few long-haul arrivals. Budget airlines serving Dubrovnik include easyJet, Volotea, and Norwegian. Alternative airports to shop include Tivat and Podgorica in nearby Montenegro. The unit of currency in Croatia is the Kuna. At this writing, a U.S. dollar will buy about seven Kunas. Public transport in Dubrovnik is cheap and efficient. You can purchase a 24-hour pass allowing unlimited bus rides for under USD 5. Venturing well beyond the city boundaries will result in higher costs, so plan accordingly. Taxi cabs in Dubrovnik serve the cruise port and a network of local hotels. You'll pay a fixed rate just for getting in the cab, the metered cost, and a mandatory 10 percent gratuity. Despite years of war, the Old City of Dubrovnik remains largely intact and exceedingly beautiful. You can spend days exploring it. A Dubrovnik-must is to walk around the top of the ancient wall that surrounds this section. The entire route is more than a mile, and be warned that you'll pay an entrance fee and additional charges for a headphone set that allows for a self-guided tour. A human guide also can be hired. The wall is not level, so you'll encounter stairs along the way. The cost for this activity could exceed USD 20, but you will not soon forget the experience. It's a splurge that adds value to your trip. Views from the wall are spectacular, and you'll learn much about the colorful history of this city at your own pace. Allow at least half a day for this Dubrovnik essential, and try to start as early in the morning as possible. In summer, crowds and heat will diminish the pleasure as the day unfolds. Make note of operating hours, which vary greatly by season. 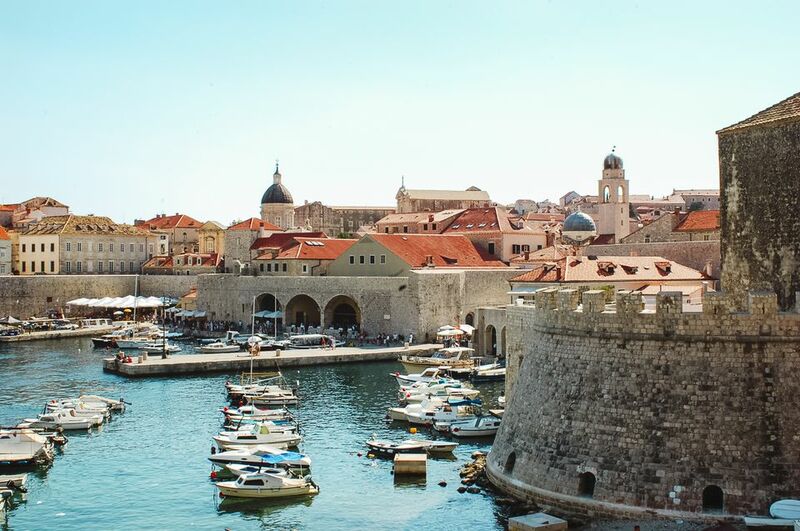 Some of the venues appearing in the Game of Thrones TV series are taken from Dubrovnik, and, as you can imagine, there are popular tours available to see those sites. Unless you're a big fan of the show, it's best skipped on a budget trip, as costs often exceed USD 50/person. Another splurge some people love in warm weather is a kayak tour that affords sweeping views of the coastline most visitors never see. Some operators offer a water-tight bucket for storing your phone and other essentials. Check locally for reputable operations, as there have been some travel scams associated with this activity. A cable car will take you to the top of nearby Srd Hill, where it's claimed the view will extend 60 km. (37 mi.) on a clear day. For fit budget travelers who want to avoid the $20 round-trip charge, it's possible to hike to the same vantage point at no cost. You can also ride the cable car to the summit and walk down for about $12. If you pay for a city wall walk, take note: admission to nearby Fortress Lovrijenac (Fort Saint Lawrence) is free. The fort sits about 120 ft. Above the water and was constructed more than 1,000 years ago in a period of about three months for protection from possible Venitian invaders. Dubrovnik dining has become much more expensive in recent years, and the trend is likely to remain on an upward trajectory. Try to splurge on at least one nice meal. Some restaurants offer sweeping views of city and sea, and a few tiny places exist within the cliffs. Seating is limited, and prices tend to be high. Find a place where prices are based on the quality of food, not the view. This city offers a host of vantage points for picnics. Find a local market, assemble your portable meal, and enjoy. More than half of Dubrovnik's 2 million annual visitors arrive via cruise ship. The busiest season for these arrivals is summer. If you are arriving by some other means, it pays to make a note of how the cruise passengers could affect your day. Lines will be longer at restaurants and attractions when the passengers debark. It sometimes pays to schedule such activities for earlier in the morning or later in the evening -- times in which cruise passengers are more likely to be aboard the ship. Nearly a third of visitors to Dubrovnik book accommodations in private homes or vacation rentals rather than traditional hotels. These options can be 10 miles or more from the city center. Be prepared to add cab fare to your expenses, or find out if there is a bus stop within walking distance. Some of these rooms go for under $50 per night and offer the added benefit of kitchen facilities for saving money on the cost of food. The next step up is to rent a private villa. Some come with terrace views of the sea. If you're more comfortable with hotels, a variety of options exists. It's possible to find highly rated hotels in the Old City for under $200/night. Dubrovnik is a compact city, and transportation here is cheap. But many visitors, especially the cruise arrivals, spend more than a few hours exploring. If you have more time, here are some added budget considerations. Cavtat is a town just north of the Dubrovnik Airport that is packed with artistic attractions and a nice beach. It is a terrific day trip from Dubrovnik. If your time is limited, focus on the Rector's Palace and the old town. Museums in Dubrovnik provide great insights into the history of this place, and most charge modest admission fees (under $10 USD). To understand recent history, visit the Museum of Croatian War of Independence. Exhibits portray the precarious situation of citizens here during the 1991-1995 period. Skip the expensive tours and find your own way around the Old Town. The Tourism Board has seven offices in Dubrovnik, and they provide excellent maps and current information for putting together your own custom low-cost tour. One key attraction not to miss on your self-guided tour is The Jesuit Church of St. Ignacio. Modeled after its namesake in Rome, it features beautiful murals from artist Gaetano Garcia.